What an ingenious design. Take something built for Afghanistan and make it for hunters. Fun fact: many military members are outdoorsman, too. Now I can attach the pouches I already own to carry gear like GPS, binos, etc. Modeled after the issue FLC but designed for improved performance. I was initially worried about one size fitting all, but the side adjustments are very generous. We have made a small selection of our products in blaze orange to meet the needs of our local hunting community, as well as RSO (Range Safety Officers) and other roles which a hi-vis tactical vest is needed. 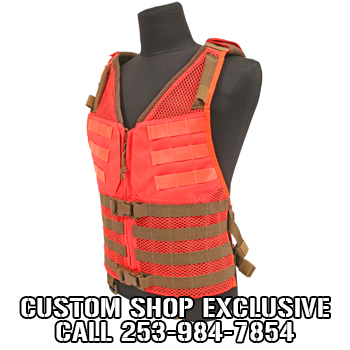 This unique MAT-V Tactical Vest is available in very limited quantities. Only available while supplies last! The Modular Adjustable Tactical Vest is a modern update to the traditional modular vest. The MAT-V has been designed to combine function and comfort without sacrificing either. For starters, the major components of the vest feature Airmesh material for maximum comfort. Inside the back of the vest there is a zippered hydration pocket with a hanger suitable for bladders up to 3 liters, while the front features dual map and pen pockets, removable front buckles, hook and loop modular webbing panels and belt hangers. Generous adjustable sides allow the vest to fit almost any size body and excess webbing can be secured with hook and loop keepers.